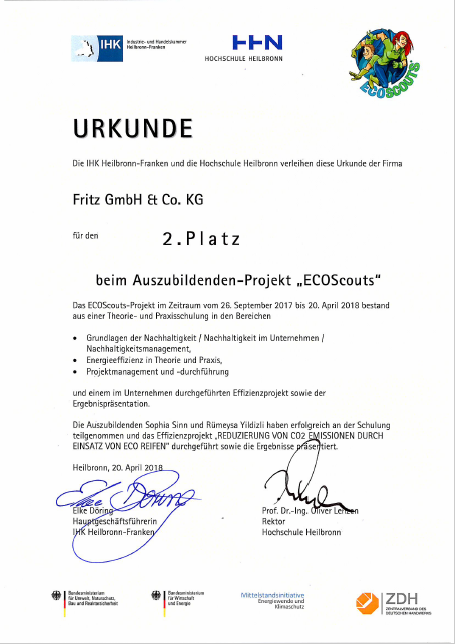 For the third time, the Fritz Group successfully participated in the trainee project “ECOScouts”. Our trainees Sophia Sinn and Rümeysa Yildizli presented their project work “Reduction of CO2 emissions through the use of Eco Tires” and the results hereof before the expert jury on Friday, April 20th. We are happy that the diligence and the effort paid off and were rewarded with an excellent 2nd place! It is the many big and small steps, projects like this, the awareness in all areas and all the employees that lead to the success and continuous improvement of our environmental management. We congratulate our two apprentices on this great success. We are very proud of you! What is the project “ECOScouts”? The trainees learn step by step how to identify potentials for improvement in the energy and environmental sectors and to identify, collect and analyze the necessary data. Afterwards, appropriate optimization measures are worked out, savings are calculated and a project outline is prepared. A training day on project management topics completes the three days of attendance and heralds the two and a half month project phase. In their own company, the apprentices then work on their own project and present it to a jury. The EnergyScouts project was launched by the company ebm-papst Mulfingen GmbH & Co. KG. Since 2010, young trainees have been qualified in the field of energy efficiency. The IHK Heilbronn-Franken was involved early in the project. In cooperation with the Heilbronn University, the EnergyScouts and the NEA trainees started in 2015. In addition to energy efficiency and climate protection, the topics “sustainable development” and “environmental protection” were included in the training program for the first time. This resulted in the EcoScouts in 2017.